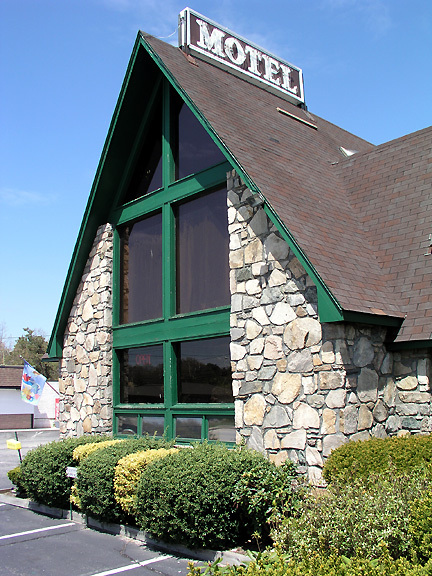 Head West past Dunns Corners and you’ll find a building that resembles a Swiss chalet: The Cornerstone Inn. In the lobby, you’ll find local crafts for sale and a brief refuge from the chillingly bizarre “Dusty’s Snowman” statue next door that, Janus-like, gazes down both directions of the road. 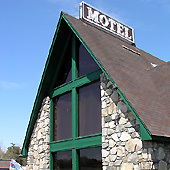 Nearby on the Old Post Road, the Blue Star Motor Inn awaits. 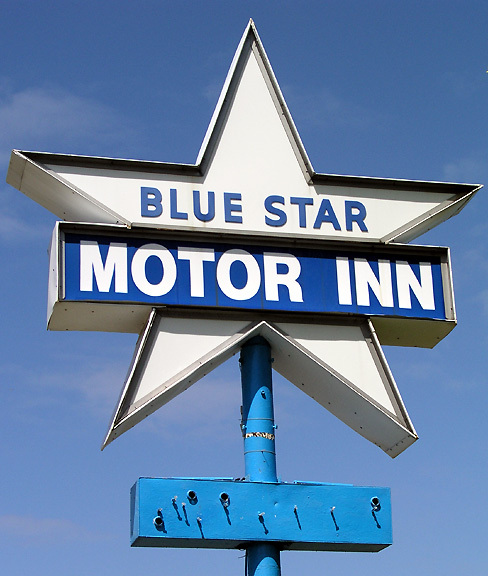 When you’re on the road long enough, dodging backlit plastic marquees that hardly apologize for their lame replacement of the signs that once stood in their places, you get nervous when a motel named “Blue Star” announces itself down the road. 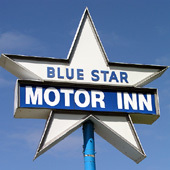 These days you can be certain you will most certainly not see a Blue Star, merely a san serif lettered box that conjures nothing but the depressing choice to stay in yet another forgettable motel. But when you cruise into toward Westerly, you fall under the spell of a genuine Blue Star, standing atop a tall pole. At last, a real motel with a pool, picnic grounds, and rooms still advertising “wall to wall” carpeting as a selling point.